This treatment uses the joint effects of a hot bath (muscle relaxing) and massage (water jet). The therapy is carried out in a bath tub; the attendant massages specific areas of the body using a jet of water held at a right angle to the surface of the body. In the course of this treatment developed in Hungary, the patient (guest) is suspended in the water by the neck or under the arms. 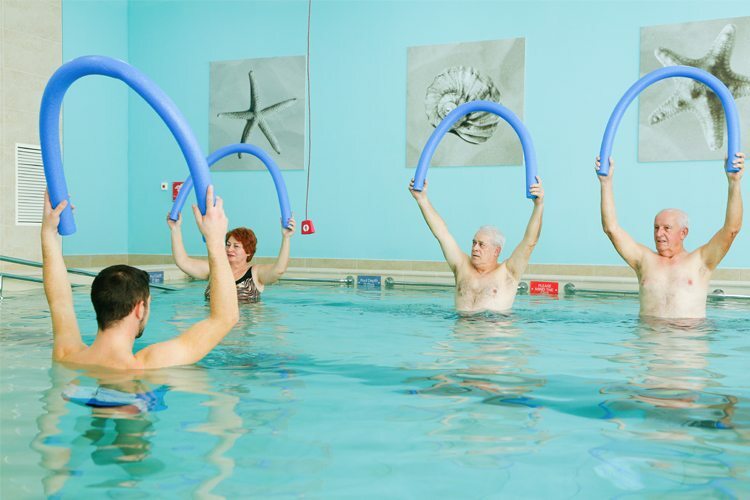 The treatment gently eases pressure on the backbone by using water buoyancy. The main indications include degenerative diseases of the backbone and milder cases of intervertebral disk disorders. The treatment also has beneficial results in the case of abrasive disorders of the thigh and knee-joints. The effect of the treatment can be enhanced by hanging weights (as recommended by the doctor) on the waist or ankles. The four (or, in some cases, only two) limbs are immersed in small tubs the temperature of which is changed periodically and automatically over a broad range. It has a positive impact on the circulation in the limbs. Procedures applied for a wide range of indications with the aim of cooling or warming certain parts of the body, often using medicaments or natural materials (e.g. chamomile) concurrently. Sebastian Kneipp (1821-1897), parish priest of Bad Wörishofen used stimuli resulting from the alternating application of cold and warm water to stimulate the metabolism and circulation. The cure involves various water dousings, shower treatments, medicinal baths, much physical exercise, herbal teas and diet. In general, it is used for chronic catarrhs of the upper respiratory tracts or allergic respiratory complaints; both medicaments and vaporized medicinal waters may be inhaled.